Riley Blackthorne’s life as a Demon Trapper is about to hit the wall. Knowing she will always be a target for those who want to exploit her “connections” with Hell, she’s learning defensive magic. It seems the only way to ensure she and her fiancé, Denver Beck, have a future together. But not everyone in Atlanta, or at the Vatican, is pleased by this news. In fact, some want to ban the use of all magic, and Riley would make the perfect scapegoat. As a new demonic enemy stalks her, Guild politics roil the city, throwing the trappers into chaos. To protect herself and the man she loves, Riley will be forced to choose: continue in her legendary father’s footsteps, or carve her own path. A path that may well lead to her losing everything she so desperately seeks to protect. Note: This review will contain potential spoilers for events in previous books. It is best to read this series in order. How I love Riley and Beck. I miss them and just when it becomes almost unbearable, Jana Oliver waves her magic writing instrument and my favorite Demon Trappers are back in new adventures. This time finds Riley on the discrimination end of the Master Trapper's list and not just on a local level. Apparently she's moved up the chain to the National level. They have discovered her working with magic users and are now targeting her. After a Guild representative personally makes his way to Atlanta, all hell breaks loose when Riley is put on probation and formally restricted from practicing magic, learning magic, consorting with magic users, or, at the very least, getting caught or turned in for doing any of that on the sly. This, of course, makes trapping demons quite difficult for Riley because all trappers use magical spheres to rid their cities of demons. If she continues to trap then she not only endangers herself but all who choose to work with her. The Guild is setting her up - but why? The playing field has changed for Riley. After what happened in Grave Matters, she has taken to learning a little bit of defensive magic. She works with both the local witches and the local summoners so we get to see characters from other books that we've grown to know and some we've even grown to love. Word has come down from the National Guild, however, that makes magical ability a no-no for her. She works as best she can with the limitations being imposed but when she is confronted by another Archfiend, she knows that something has to give before she really does end up losing her life. Beck is back in town from his training as Grand Master in Edinburgh just in time for the holidays. He has Riley's back 200%, which helps reduce her anxiety of working without magic. Simon, Riley's ex from a few books ago, also returns to Atlanta. He is now a Vatican trained exorcist and, while Riley is sidelined from magic, Simon has permission to use her help. It was nice to see them working together again after their previous falling out. As in the rest of the books, the story lines are easy to follow but the twists and turns are not easily figured out. I really had no idea where the author was taking Mind Games but it was true to its title. There are a lot of mind games played in this book. I also love the emotional feel to these books. The love between Beck and Riley is undeniable. The anger and frustration Riley feels at being singled out and tossed under the bus is palpable. The ability to pull emotions out of a reader is one of the main goals that an author has and Ms. Oliver does it in all of The Demon Trapper's Daughter novels. I loved being back in the world of Riley Blackthorne. There is never a dull moment in Atlanta, making the books wonderful, engaging, and spectacular. The camaraderie between Riley and her apprentices and those in the Guild who aren't out to get her is great. She's treated as a capable member of the Demon Trappers Guild. Her relationship with Beck makes my heart sing - I knew from the first book that these two were meant for one another. If you haven't started this series, I highly recommend them. You won't be disappointed. My review copy was purchased by me from Amazon. 5.0 out of 5 starsRiley and Beck Rule! I am so thankful that the author has decided to continue this saga. Another moment to cherish the tandem of Beck and Riley. This book entails the life of our main characters after winning their battle against the fallen angels. Riley's life continues to be shady due to the meddling of no other than the Prince of Hell. Another battle for Riley to tackle on, but of course, she is not alone in this fight. Sweet and lovable Beck is always ready to swoop in to save his Princess. ~Swooning~ I have read this book too quick. I cannot wait for the next installment. 5.0 out of 5 starsAlways Team Riley! I have been a fan since the first book.. I am so glad Jana Oliver gave us reader another wonderful book in the continuing story of The Demon Trappers Series.. I am always been on Team Riley side but seeing Riley & Beck getting it together is even better. Thank You Jana for another great book.. I hope some of those fiends come back and whisper in your ear even more. 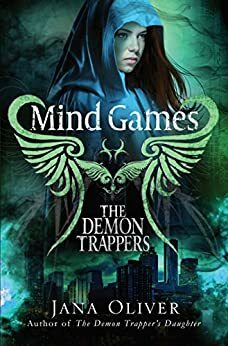 Jana Oliver cannot but help write a fantastic story, and I for one was very happy to see a continuation of her Demon Trappers series. It was wonderful to see Riley and Beck back in the saddle, to so speak, and I adored the complexity that's coming out in Riley as she makes some very important life choices. Great stuff, Ms. Oliver! 5.0 out of 5 starsOnce again Oliver delivers! Love this series! So glad to have this one now too. The characters are well thought out, have realistic growth throughout the series, and not without their share of bruises to gain it. The world Ms. Oliver has created is believable and consistent with new information getting dropped on us as things progress. As her characters learn of them, we do as well...and leaves us going OOoooooohh! If you want a fun read in a dark reflection of this world I can't recommend this series enough!